Staggering statistics of violence in Brazil continue to make headlines in the country and abroad, but the invisibility of the victims and indifference toward them blunt the impact of the numbers. According to the 2014 Map of Violence published by FLACSO-Brazil sociologist Julio Jacobo Waiselfisz, 30,000 people between the ages of 15 and 29 – 77 percent of whom are black – are murdered in Brazil every year. 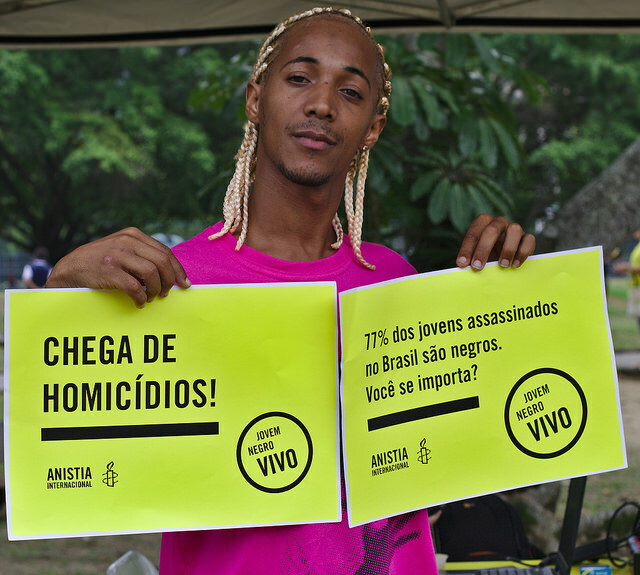 Additionally, the annual report of the widely respected Brazilian Public Security Forum indicates that in 2008-2013 the police killed at a rate of six people per day, while a research group at the Federal University of Sao Carlos (UFSCAR) found recently that 61 percent of those killed by the police in Sao Paolo State are black. The absence of popular outrage over these facts is being addressed by a range of initiatives, and social media – of which Brazilians are avid users – are an important tool to this end. In a society in which significant numbers of communities and individuals are still invisible to the state and fellow citizens, violence is not surprising. During the recent and run-off campaigns Dilma Rousseff met with grassroots leaders who demanded urgent action to end systematic violence against poor youth and police abuse. She promised them that she would push further implementation of specific youth programs such as Juventude Viva, while also recognizing the need to continue confronting racism and start taking serious measures against police abuse. Human rights organizations and community activists have pledged to hold her to her word. Communication and technology tools – which activists used during protests last year to gather evidence of police abuse through crowdsourcing – can provide a boost to citizens and activists in reclaiming public spaces and demanding better social services. Creating inclusive and participatory maps, for example, facilitates postal service, the allocation of resources, and the implementation of programs such as cultural and after-school activities that help protect vulnerable youth. Further, the use of collaborative media technologies has the potential – over time – to reduce invisibility and bring society closer to dealing with the tragedy of the violent deaths of thousands of people every year.